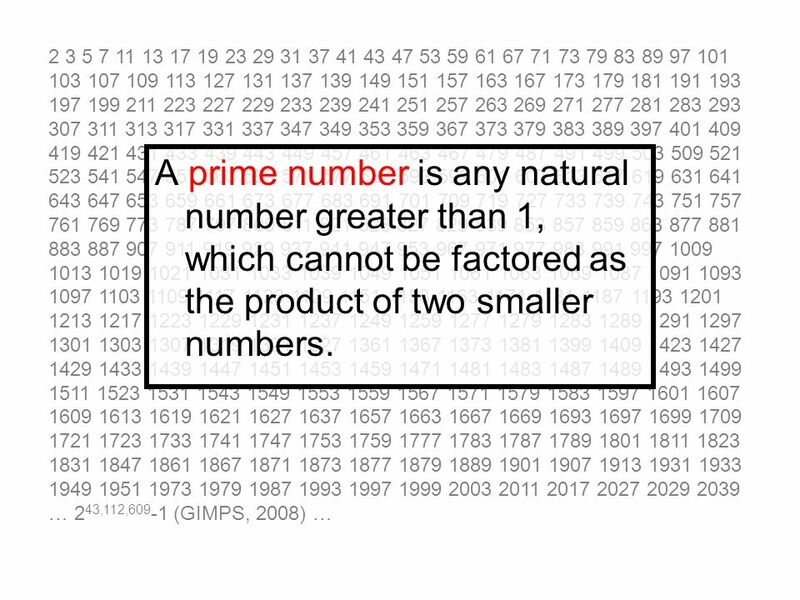 2 … 243,112,609-1 (GIMPS, 2008) … A prime number is any natural number greater than 1, which cannot be factored as the product of two smaller numbers. 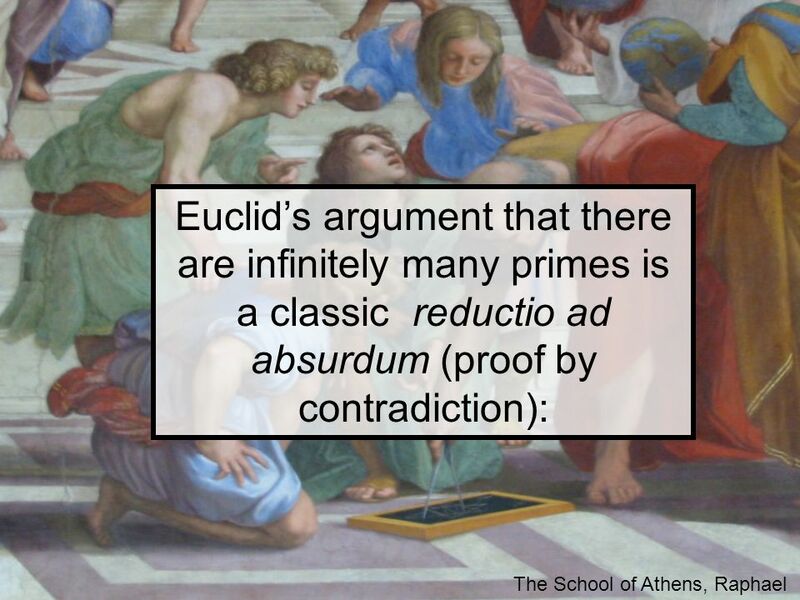 5 Euclid’s theorem (~300 BCE): There are infinitely many prime numbers. 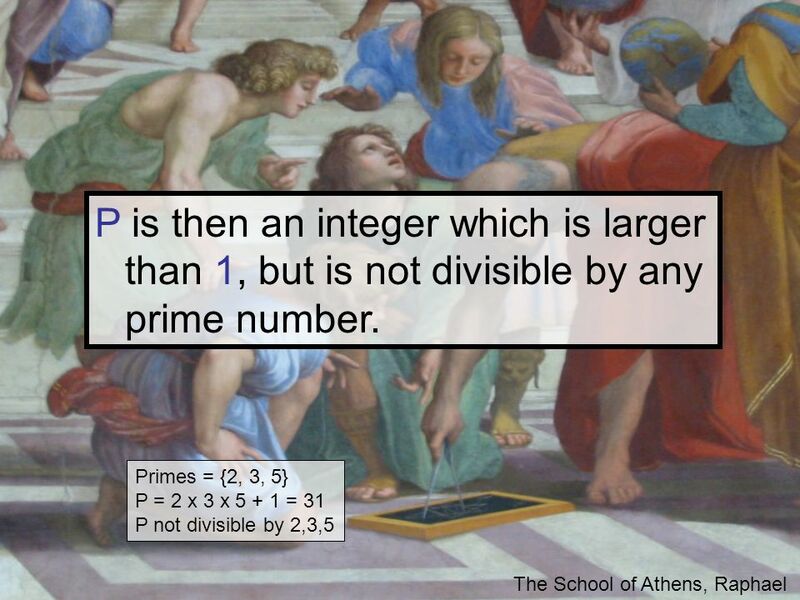 11 P is then an integer which is larger than 1, but is not divisible by any prime number. 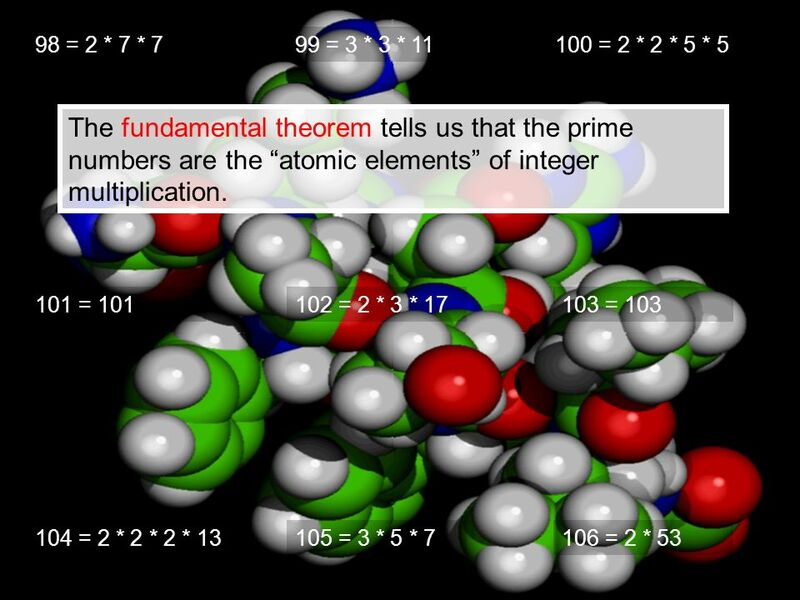 14 The fundamental theorem tells us that every number can in principle be factored into primes – but nobody knows how to factor large numbers rapidly! 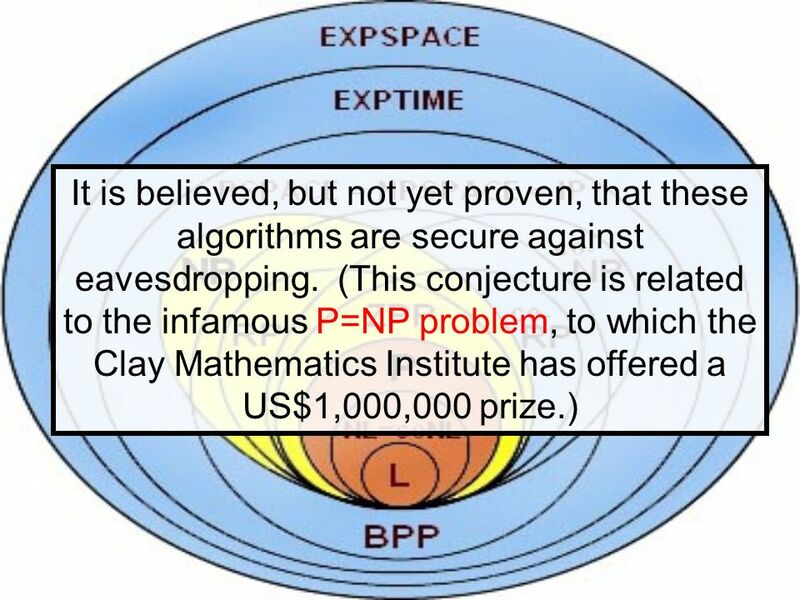 In fact, many modern cryptographic protocols - such as the RSA algorithm - rely crucially on the inability to factor large numbers (200+ digits) in a practical amount of time. 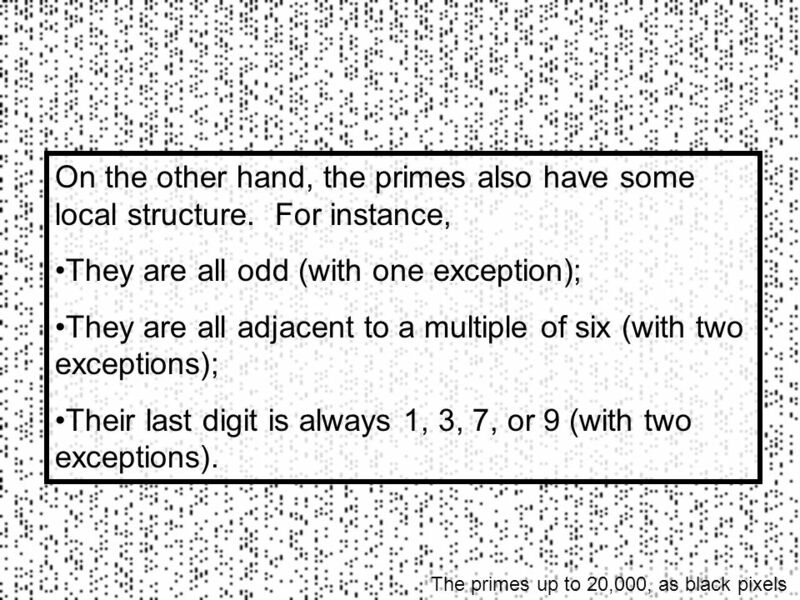 18 (3, 5), (5, 7), (11, 13), (17, 19), (29, 31), (41, 43), (59, 61), (71, 73), (101, 103), (107, 109), (137, 139), (149, 151), (179, 181), (191, 193), (197, 199), (227, 229), (239, 241), (269, 271), (281, 283), (311, 313), (347, 349), (419, 421), (431, 433), (461, 463), (521, 523), (569, 571), (599, 601), (617, 619), (641, 643), (659, 661), (809, 811), (821, 823), (827, 829), (857, 859), (881, 883), (1019, 1021), (1031, 1033), (1049, 1051), (1061, 1063), (1091, 1093), (1151, 1153), (1229, 1231), (1277, 1279), (1289, 1291), (1301, 1303), (1319, 1321), (1427, 1429), (1451, 1453), (1481, 1483), (1487, 1489), (1607, 1609), … …, (2,003,663,613 x 2195,000 +1) [Vautier, 2007], ¿…? 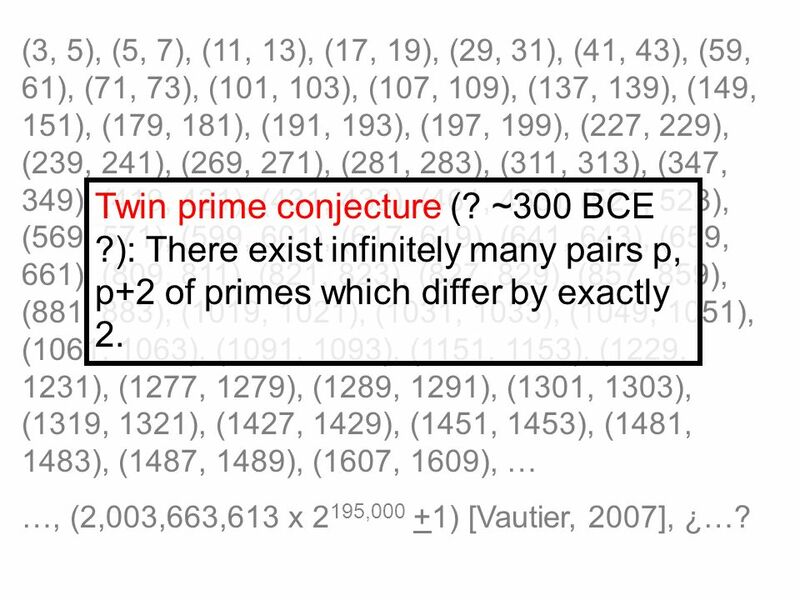 Twin prime conjecture (? 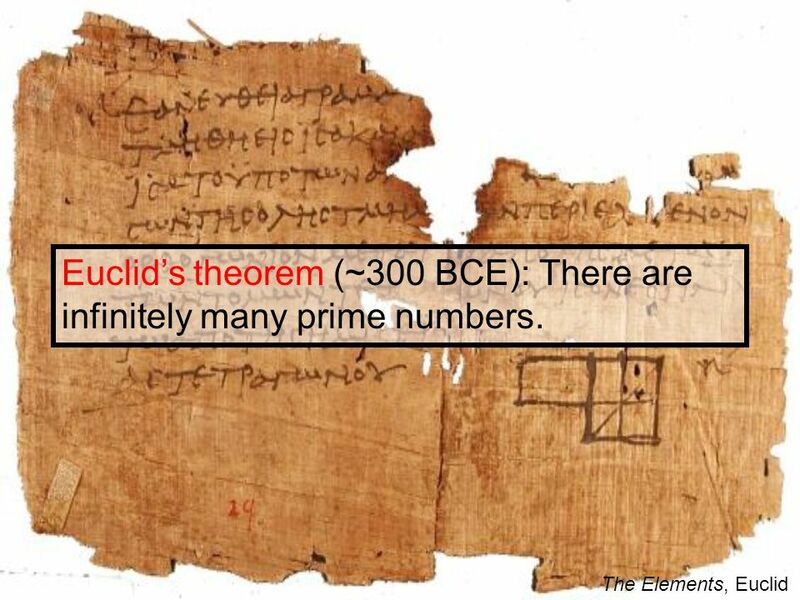 ~300 BCE ? 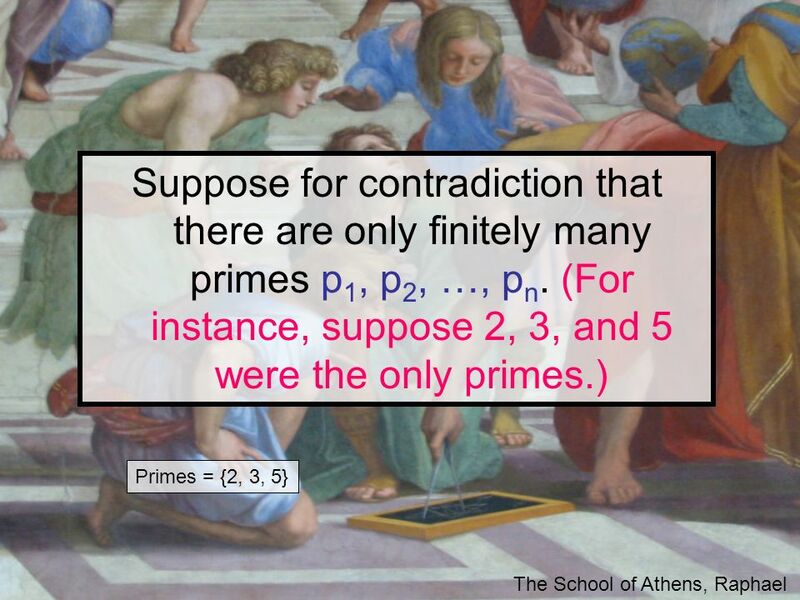 ): There exist infinitely many pairs p, p+2 of primes which differ by exactly 2. 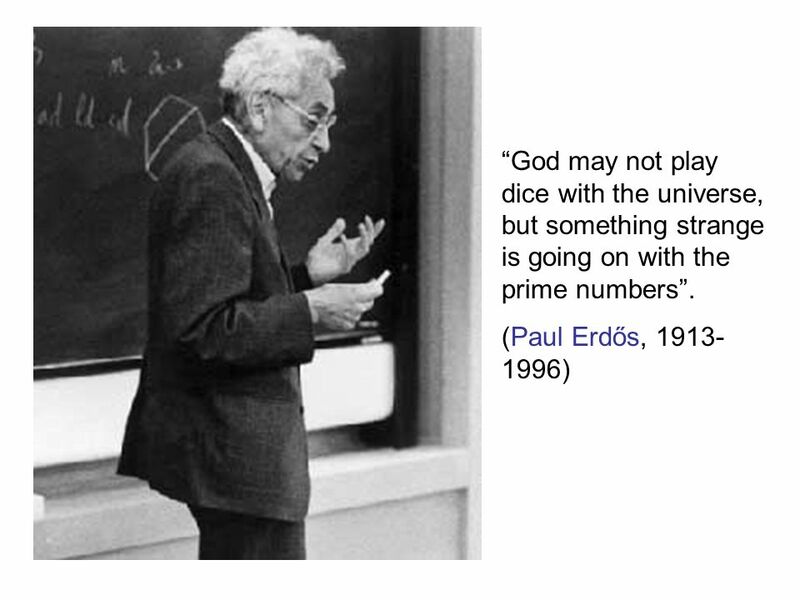 19 “God may not play dice with the universe, but something strange is going on with the prime numbers”. 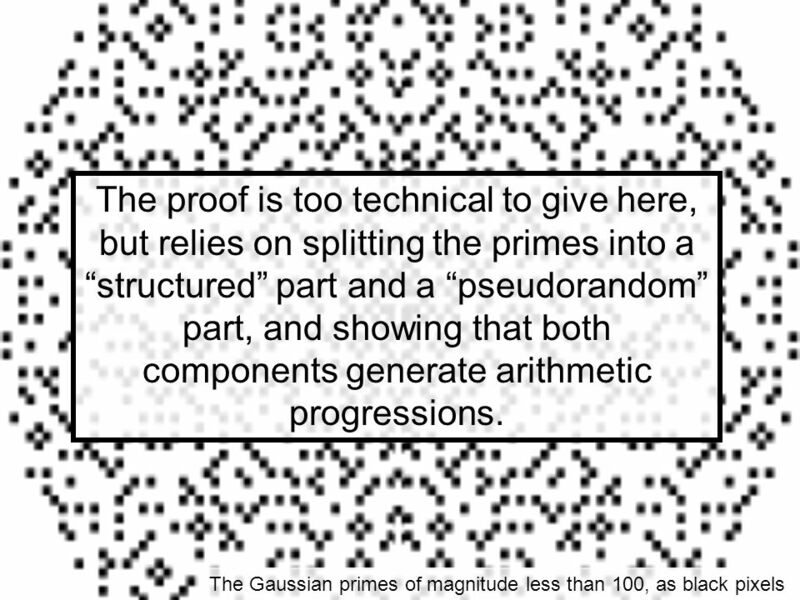 20 Our belief in the random nature of the primes is not purely of academic interest. 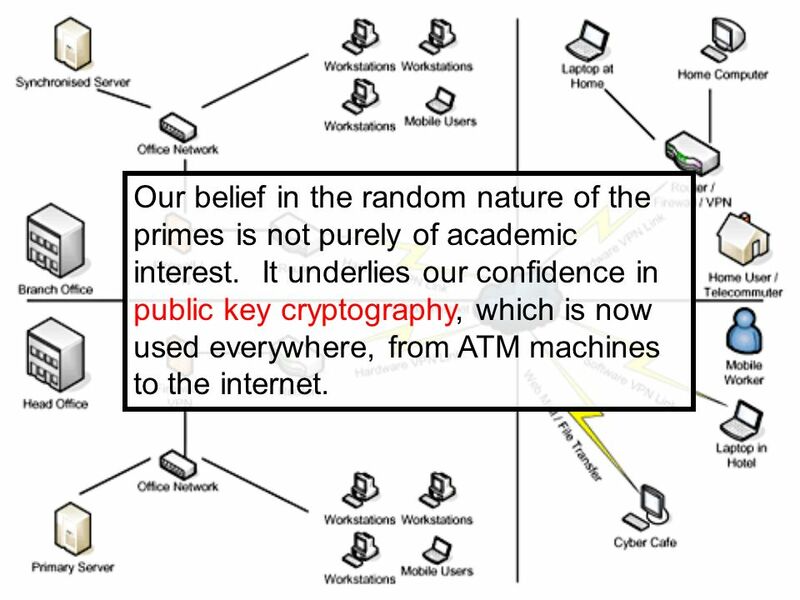 It underlies our confidence in public key cryptography, which is now used everywhere, from ATM machines to the internet. 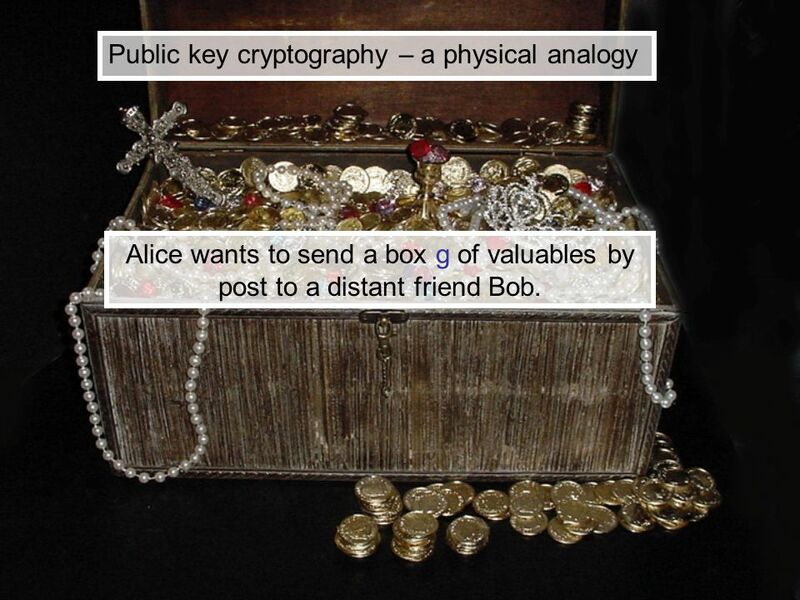 Alice wants to send a box g of valuables by post to a distant friend Bob. But Alice worries that someone may intercept the box and take the contents. 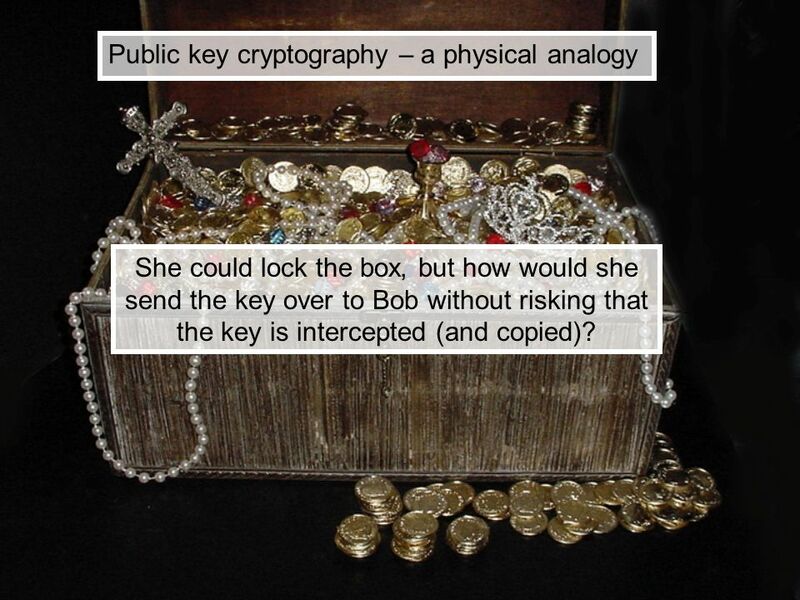 She could lock the box, but how would she send the key over to Bob without risking that the key is intercepted (and copied)? 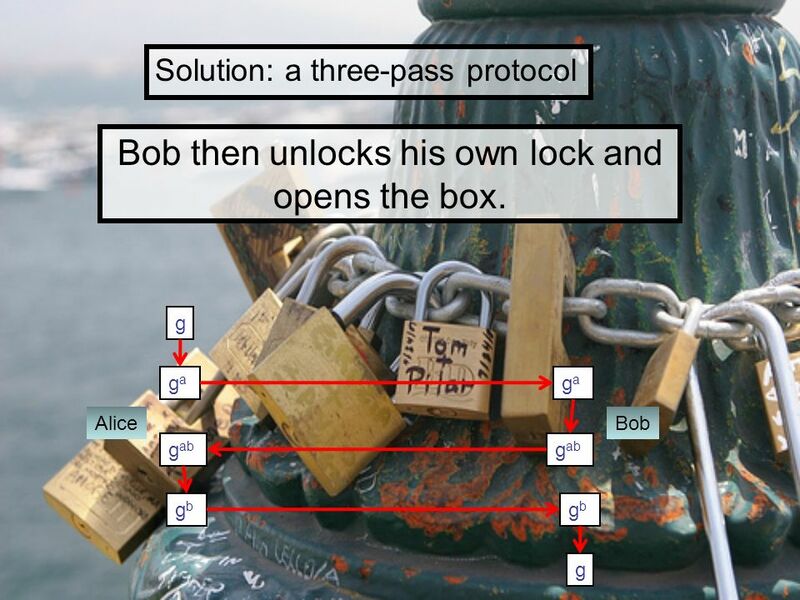 27 Bob then unlocks his own lock and opens the box. 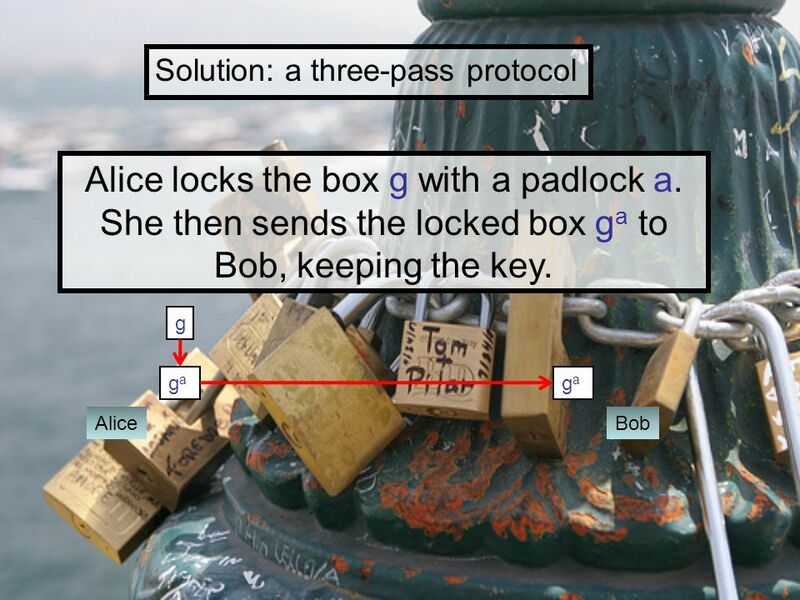 30 Alice and Bob agree (publicly) on a large prime p.
Alice “locks” g by raising it to the power a for some secretly chosen a. 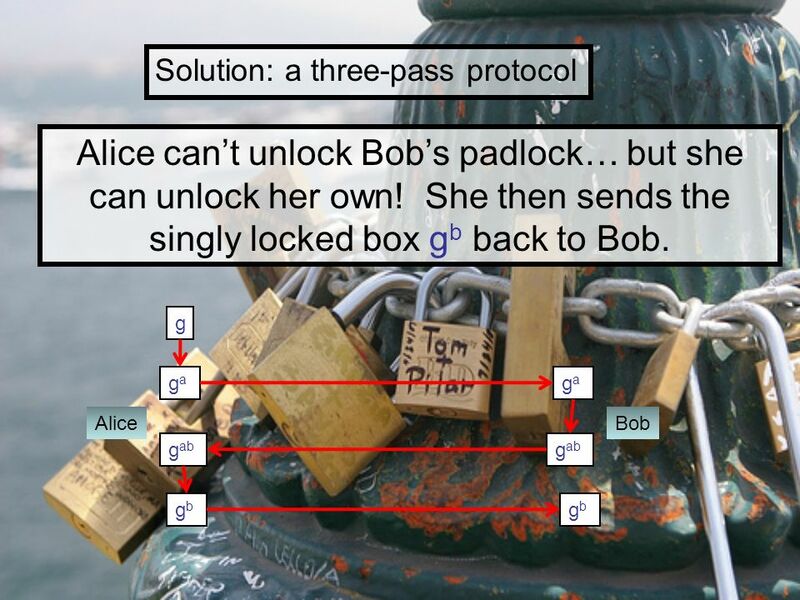 She then sends ga mod p to Bob. 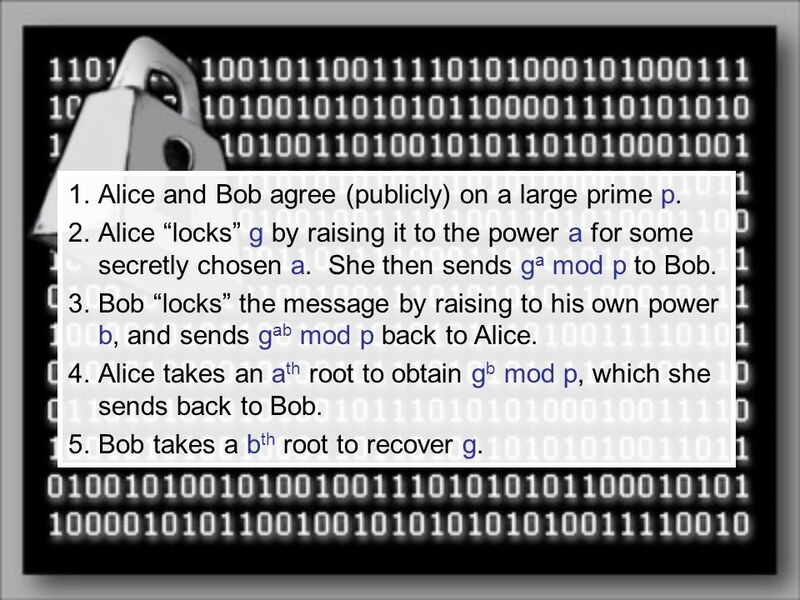 Bob “locks” the message by raising to his own power b, and sends gab mod p back to Alice. 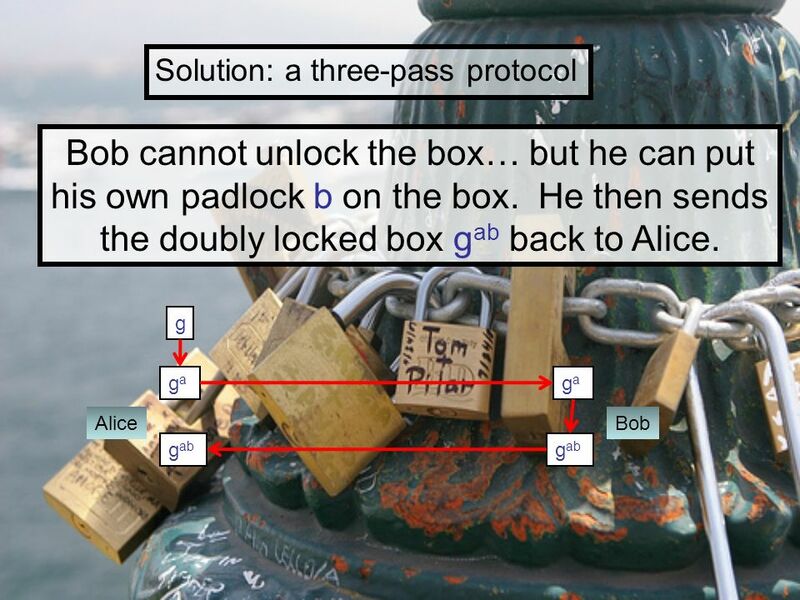 Alice takes an ath root to obtain gb mod p, which she sends back to Bob. 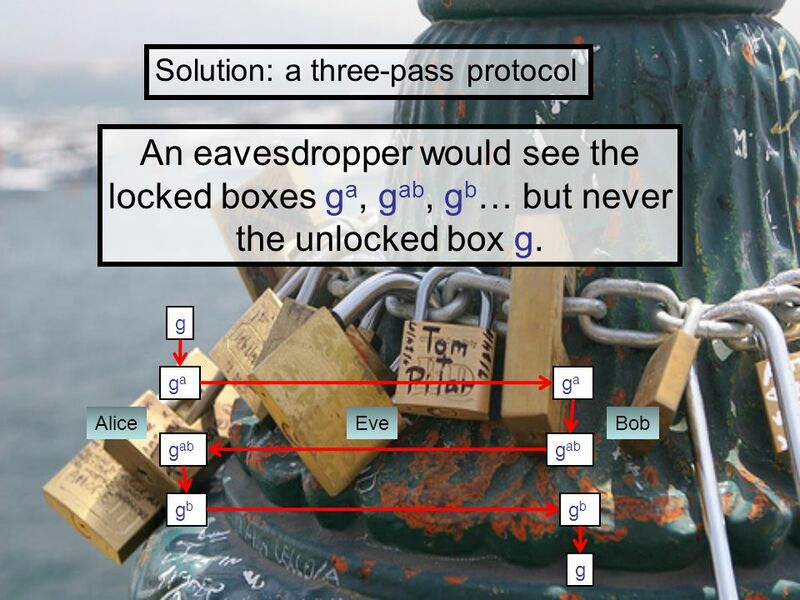 Bob takes a bth root to recover g.
33 However, it was recently shown that the data that an eavesdropper intercepts via this protocol (i.e. 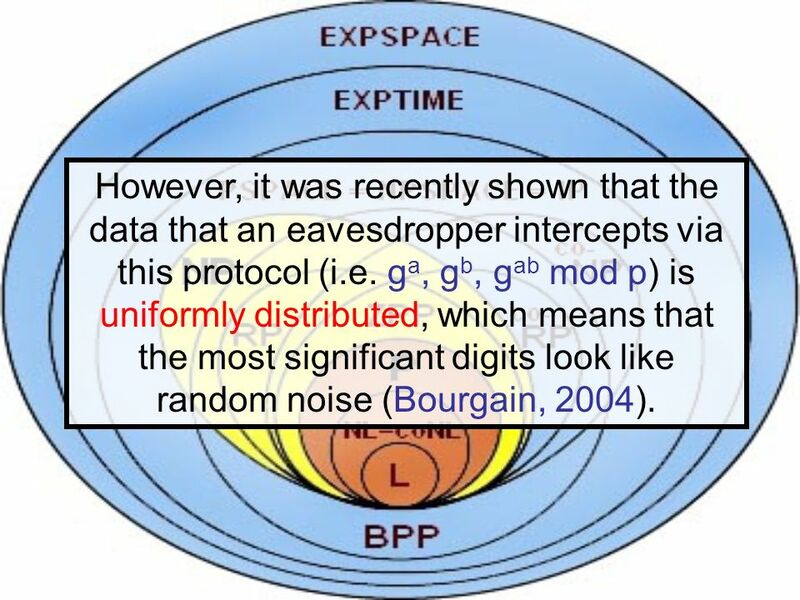 ga, gb, gab mod p) is uniformly distributed, which means that the most significant digits look like random noise (Bourgain, 2004). 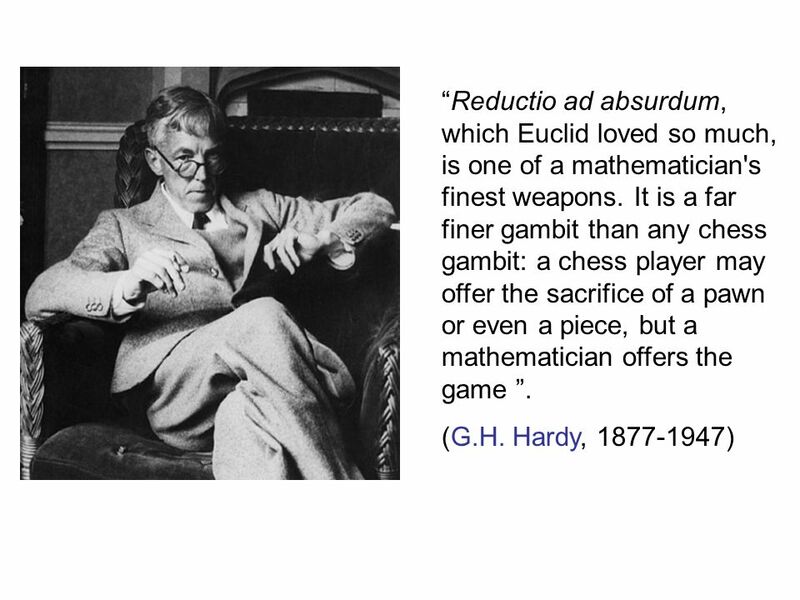 34 This is evidence towards the security of the algorithm. 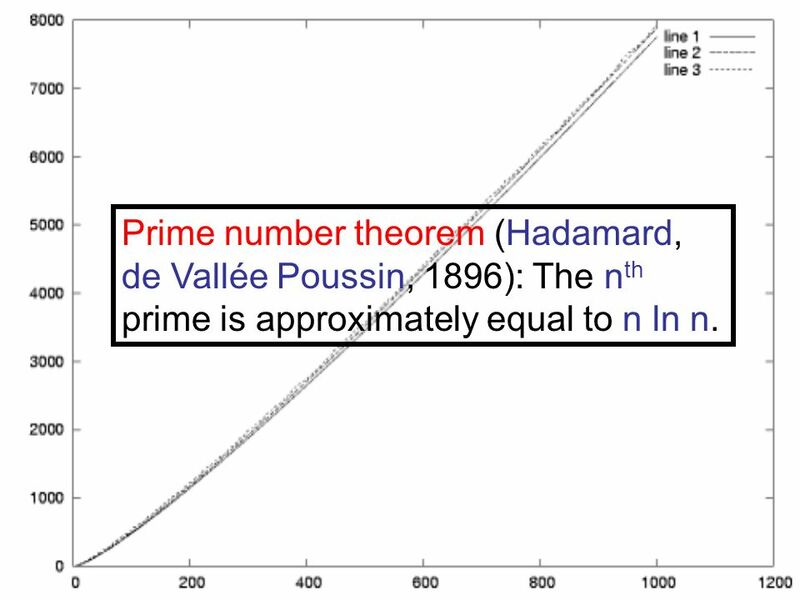 36 Prime number theorem (Hadamard, de Vallée Poussin, 1896): The nth prime is approximately equal to n ln n.
37 The Riemann hypothesis conjectures an even more precise formula for the nth prime. 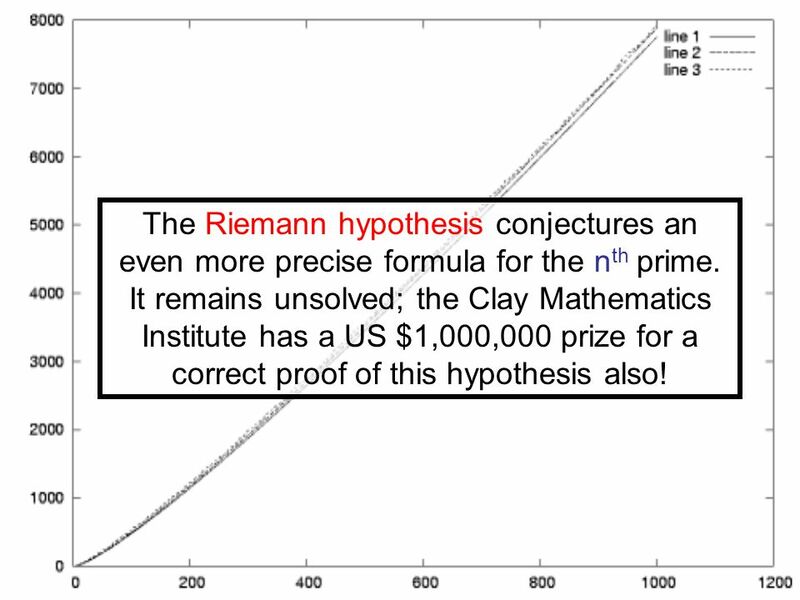 It remains unsolved; the Clay Mathematics Institute has a US $1,000,000 prize for a correct proof of this hypothesis also! 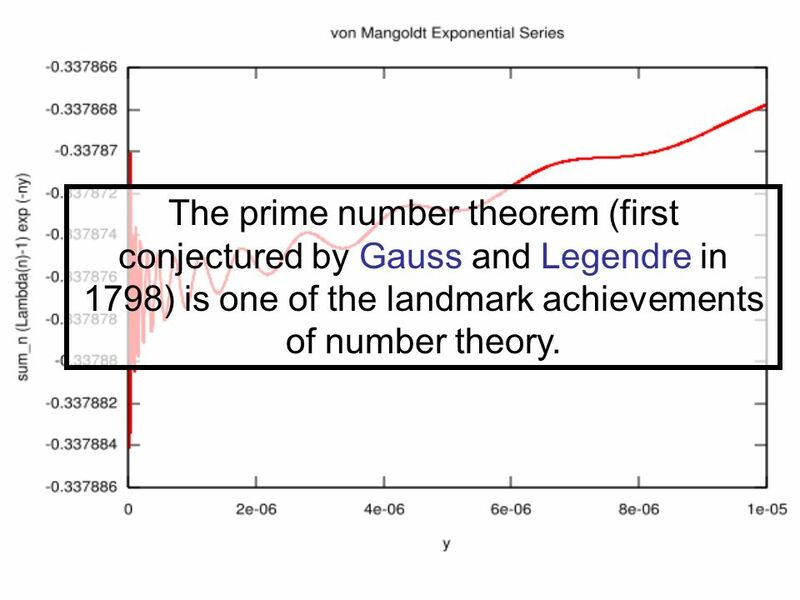 38 The prime number theorem (first conjectured by Gauss and Legendre in 1798) is one of the landmark achievements of number theory. 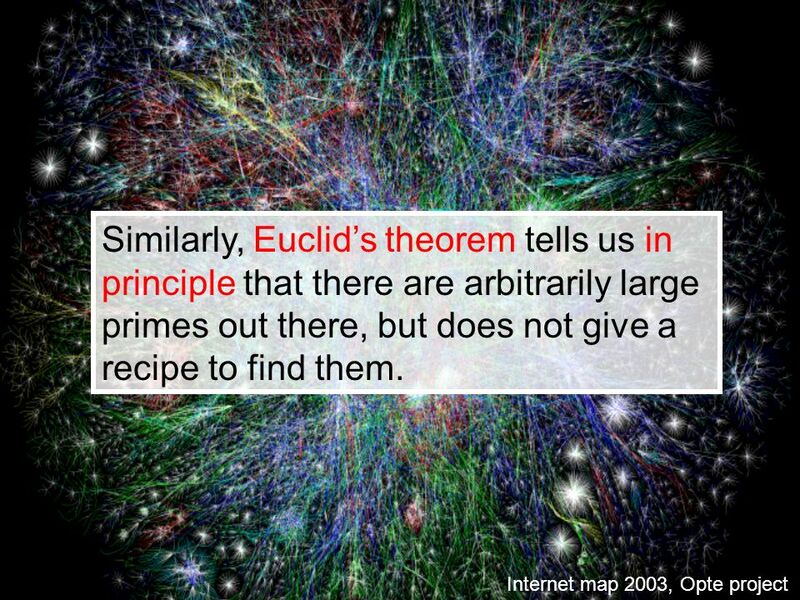 40 Step 1. 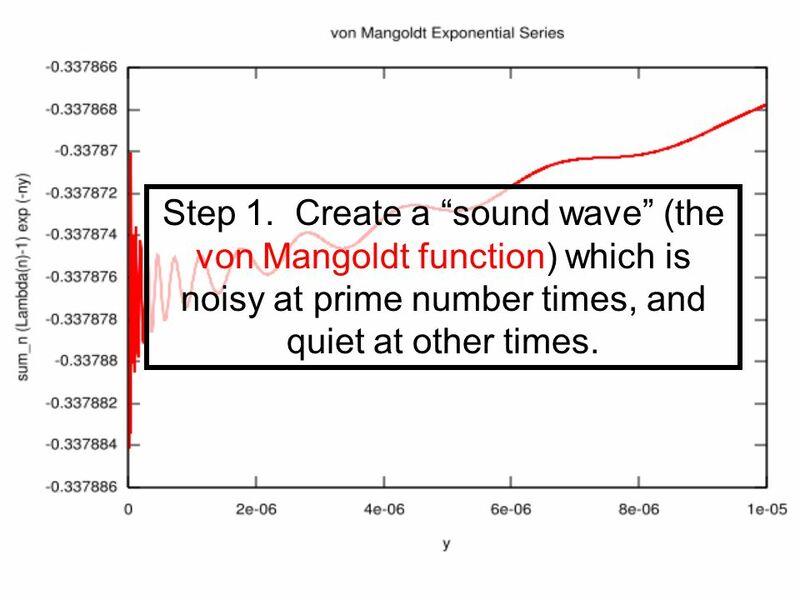 Create a “sound wave” (the von Mangoldt function) which is noisy at prime number times, and quiet at other times. 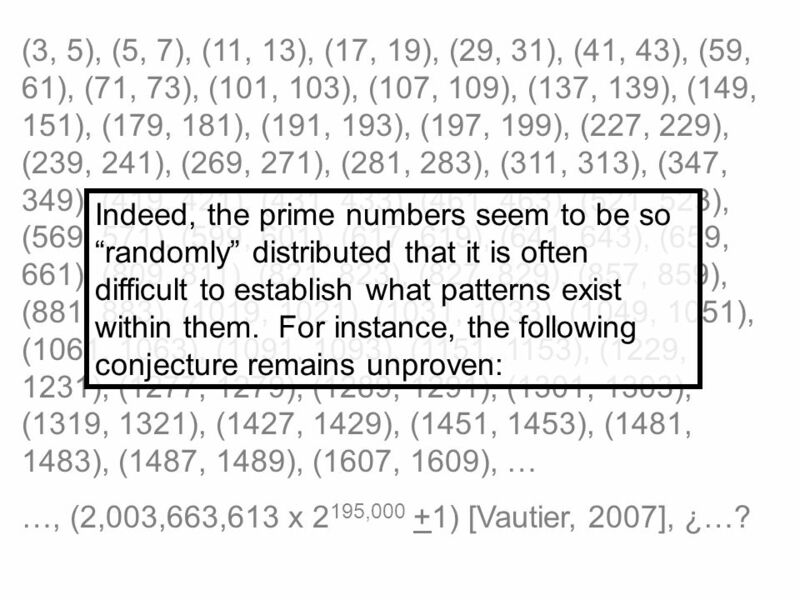 41 Step 2. 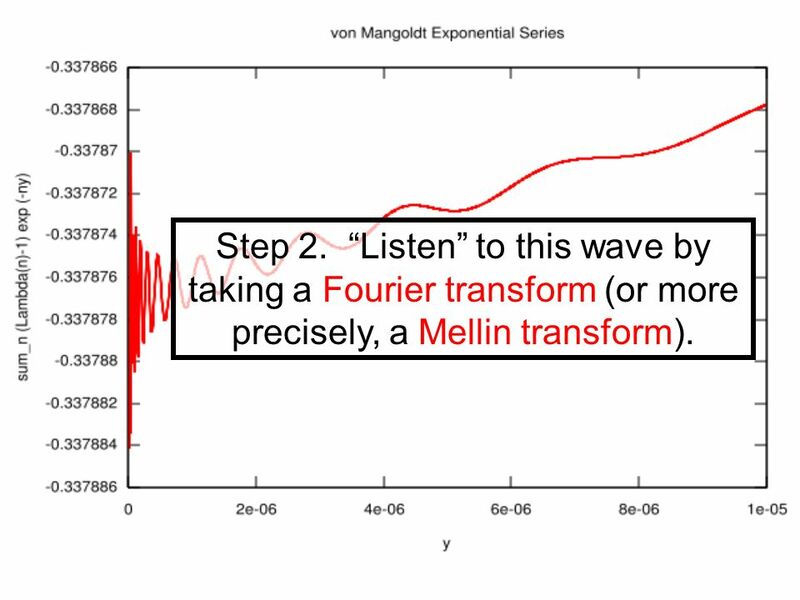 “Listen” to this wave by taking a Fourier transform (or more precisely, a Mellin transform). 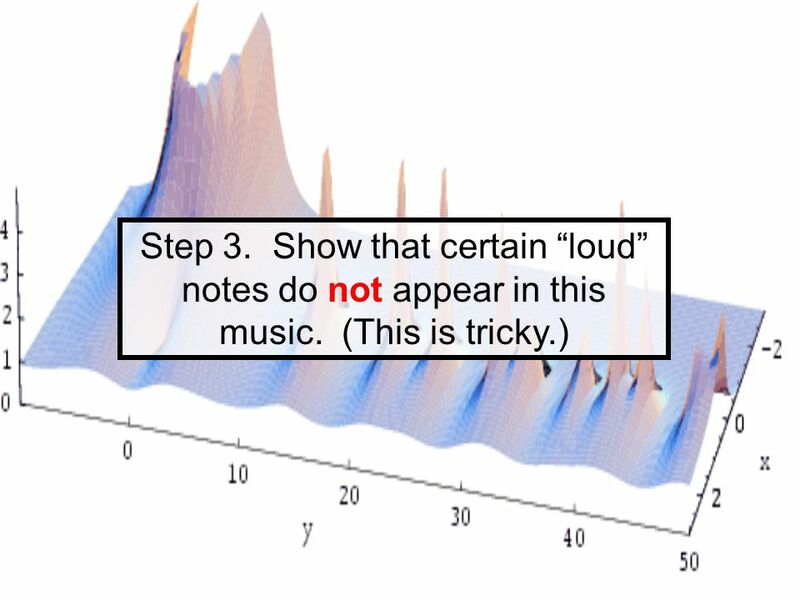 44 Step 4. 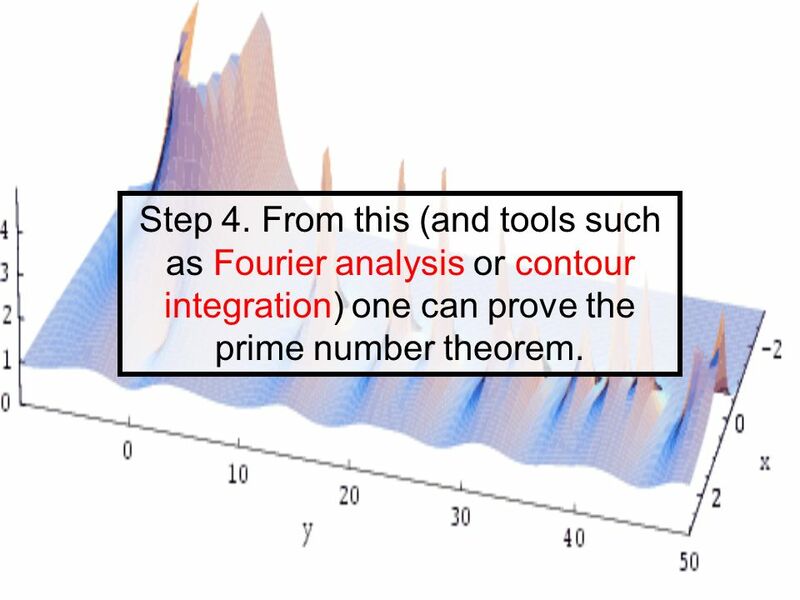 From this (and tools such as Fourier analysis or contour integration) one can prove the prime number theorem. 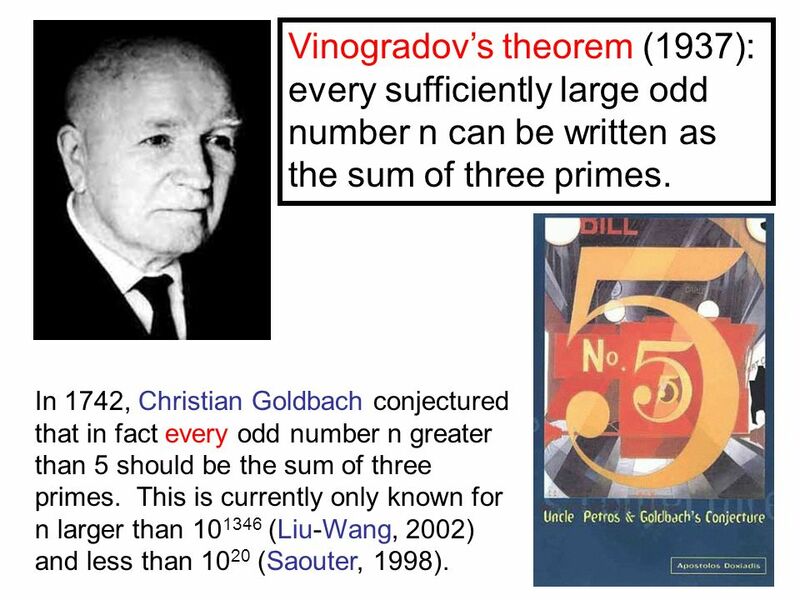 48 Vinogradov’s theorem (1937): every sufficiently large odd number n can be written as the sum of three primes. 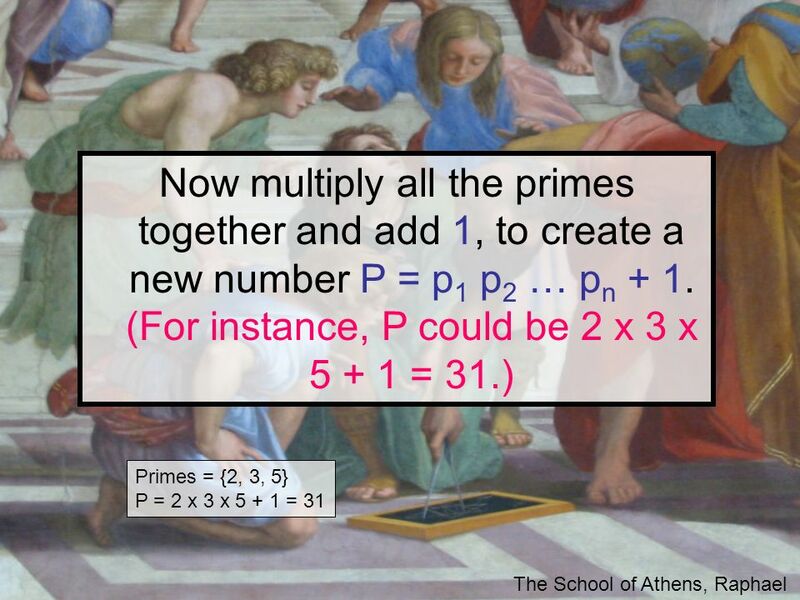 In 1742, Christian Goldbach conjectured that in fact every odd number n greater than 5 should be the sum of three primes. 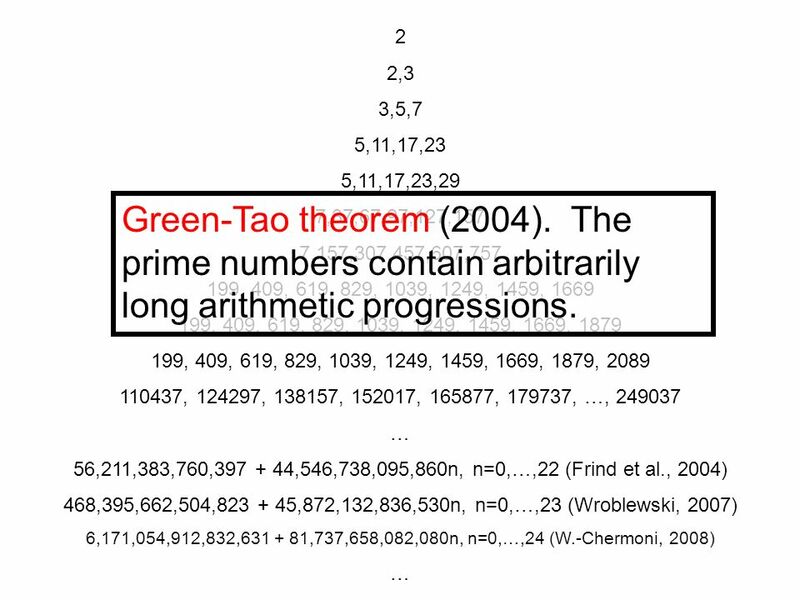 This is currently only known for n larger than (Liu-Wang, 2002) and less than 1020 (Saouter, 1998). 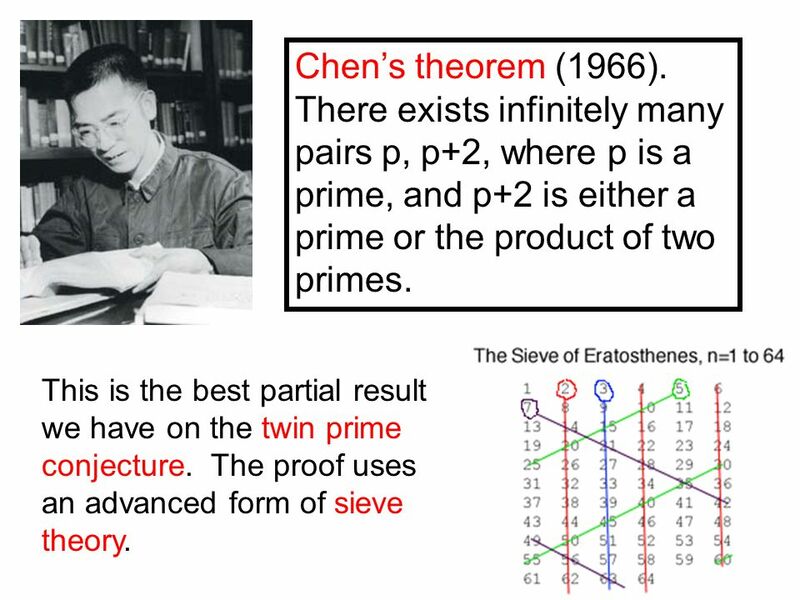 49 Chen’s theorem (1966). 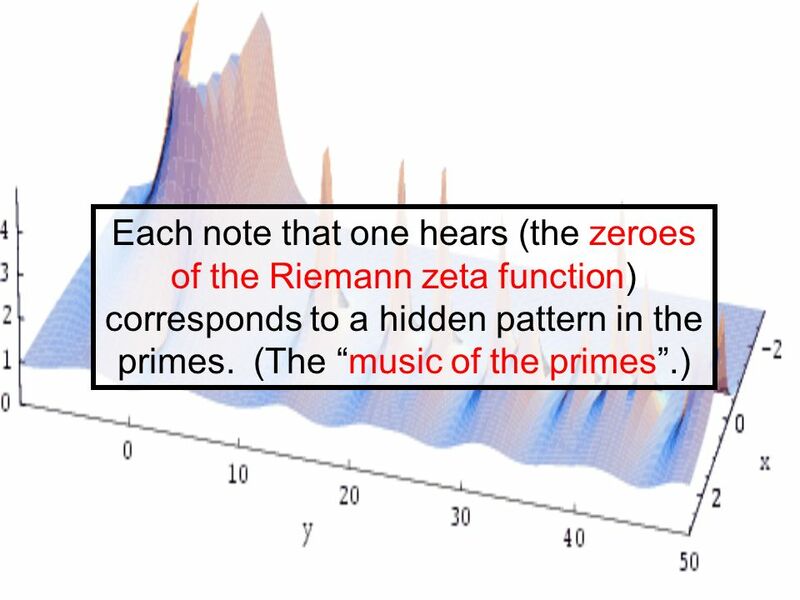 There exists infinitely many pairs p, p+2, where p is a prime, and p+2 is either a prime or the product of two primes. This is the best partial result we have on the twin prime conjecture. 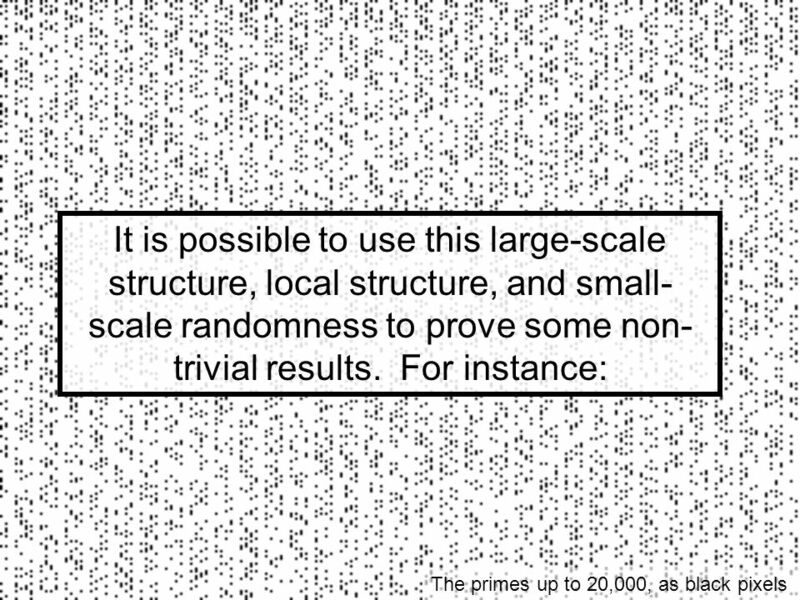 The proof uses an advanced form of sieve theory. 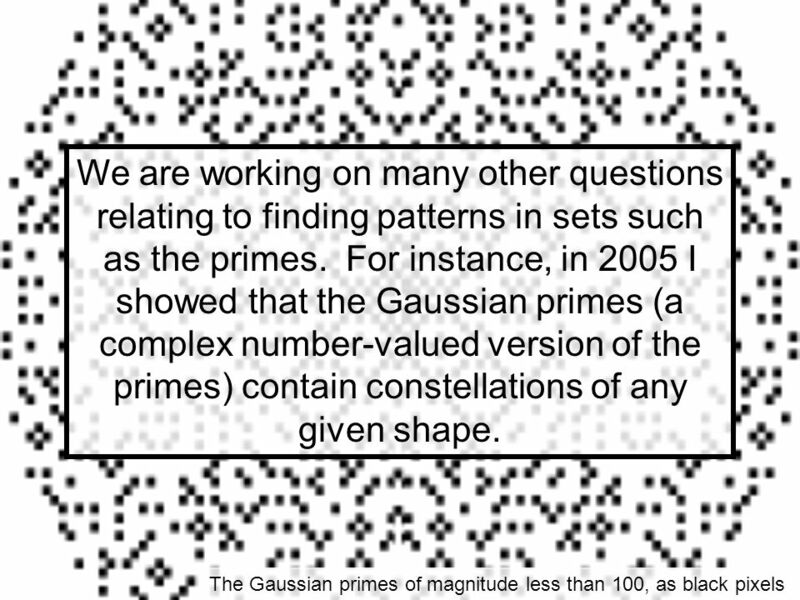 50 2 2,3 3,5,7 5,11,17,23 5,11,17,23,29 7,37,67,97,127,157 7,157,307,457,607,757 199, 409, 619, 829, 1039, 1249, 1459, 1669 199, 409, 619, 829, 1039, 1249, 1459, 1669, 1879 199, 409, 619, 829, 1039, 1249, 1459, 1669, 1879, 2089 110437, , , , , , …, … 56,211,383,760, ,546,738,095,860n, n=0,…,22 (Frind et al., 2004) 468,395,662,504, ,872,132,836,530n, n=0,…,23 (Wroblewski, 2007) 6,171,054,912,832, ,737,658,082,080n, n=0,…,24 (W.-Chermoni, 2008) Green-Tao theorem (2004). 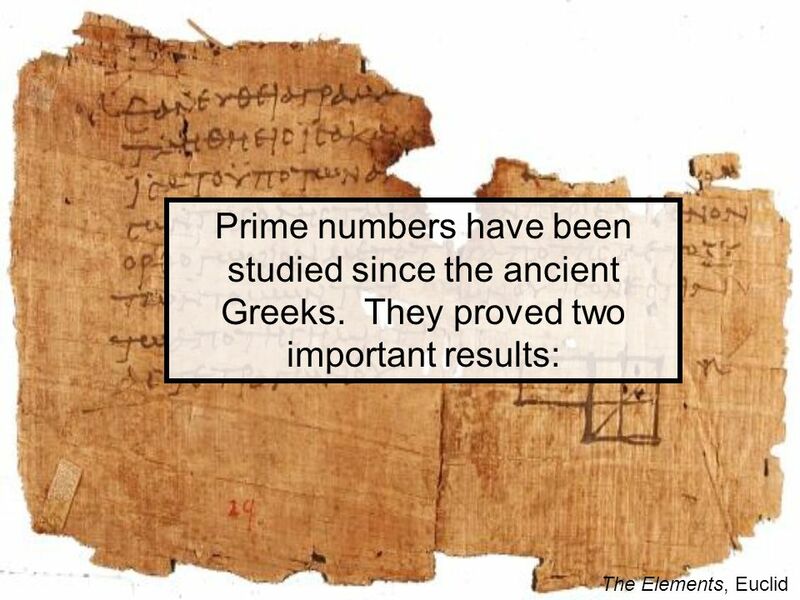 The prime numbers contain arbitrarily long arithmetic progressions. 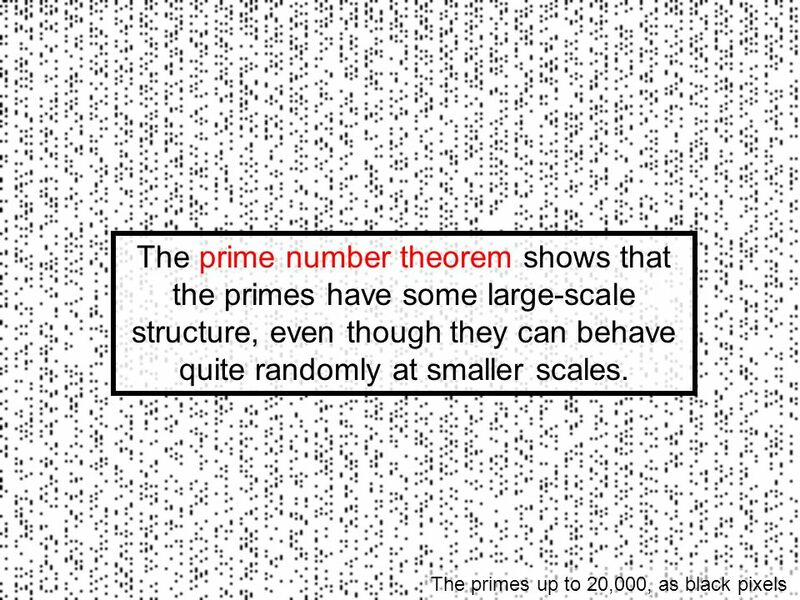 Download ppt "Structure and Randomness in the prime numbers"
Chapter 8 Introduction to Number Theory. 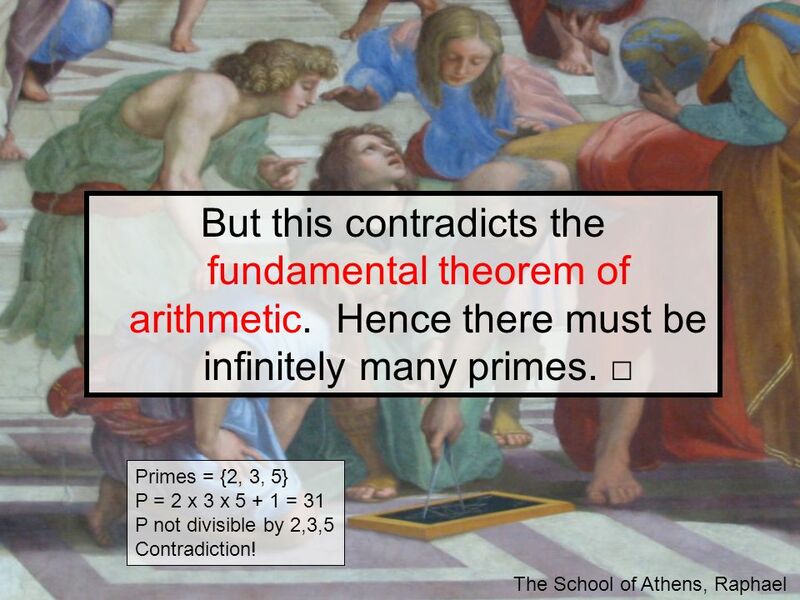 2 Contents Prime Numbers Fermats and Eulers Theorems. 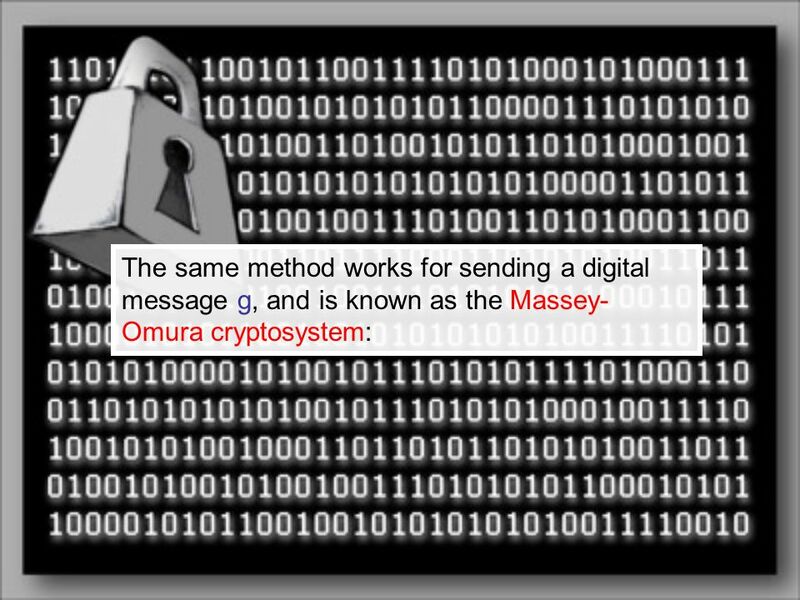 1 Pretty Good Privacy (PGP) Security for Electronic . 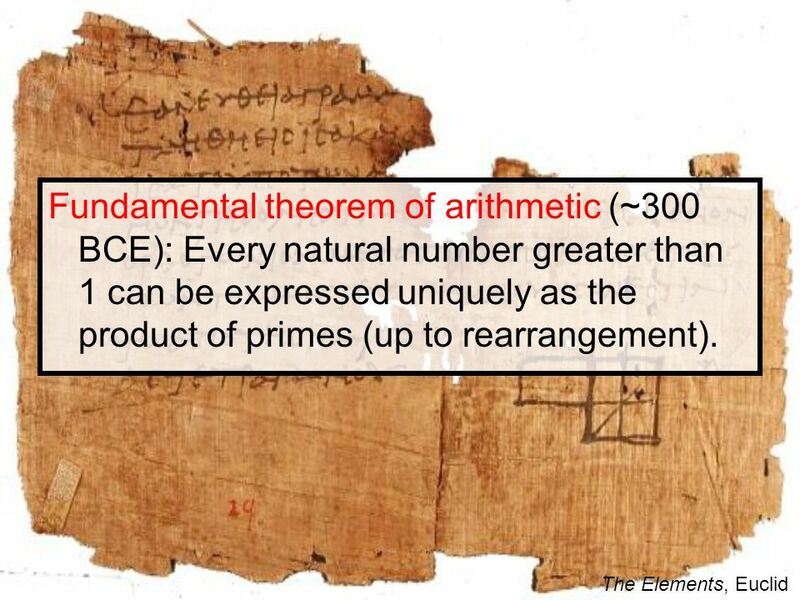 The Fundamental Theorem of Arithmetic. 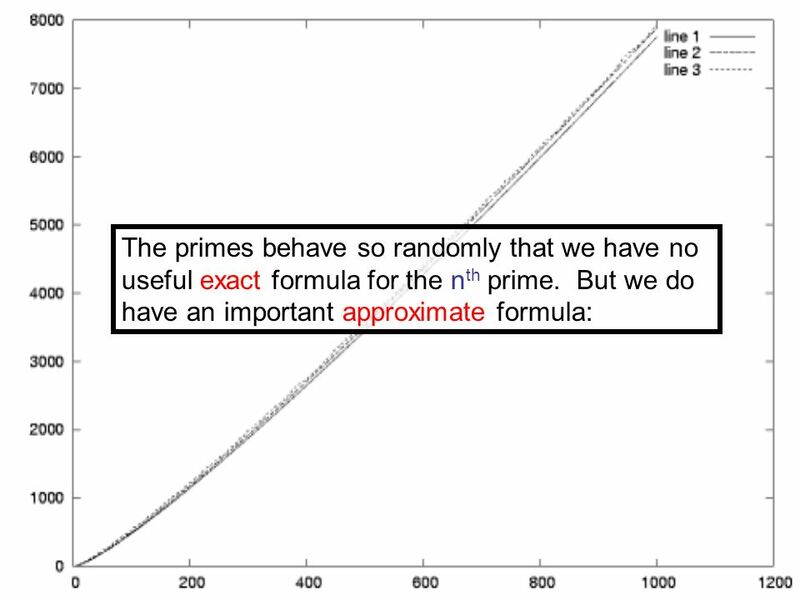 Primes p > 1 is prime if the only positive factors are 1 and p if p is not prime it is composite The Fundamental. 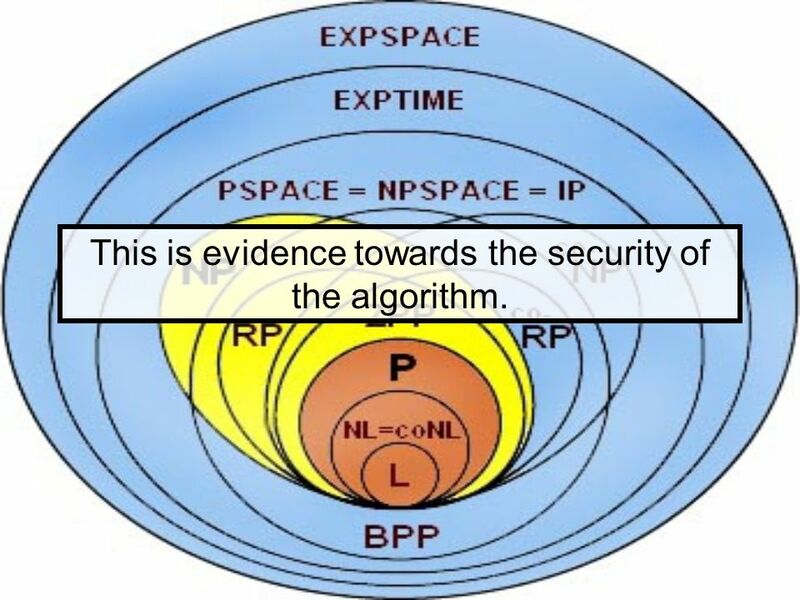 Suppression of soybean diseases through the use of cover crops Darin Eastburn University of Illinois. 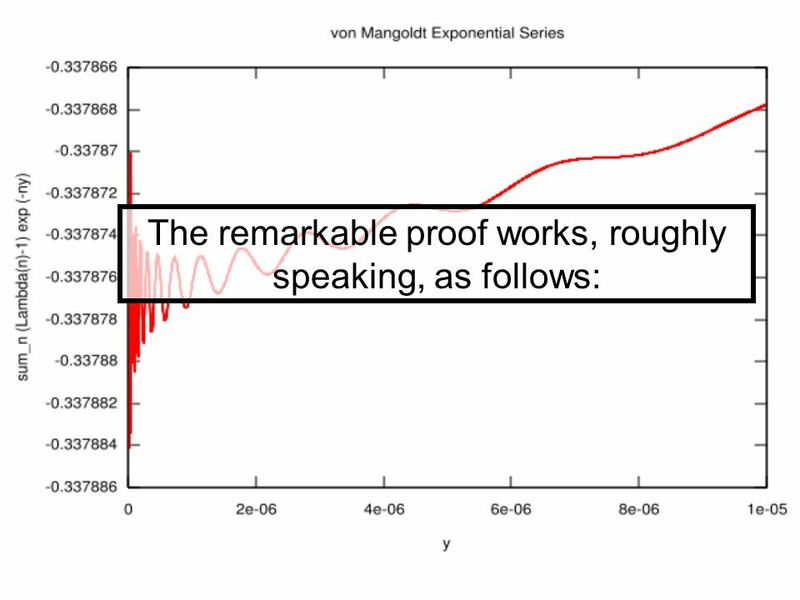 Lecture 3 – February 17, 2003. 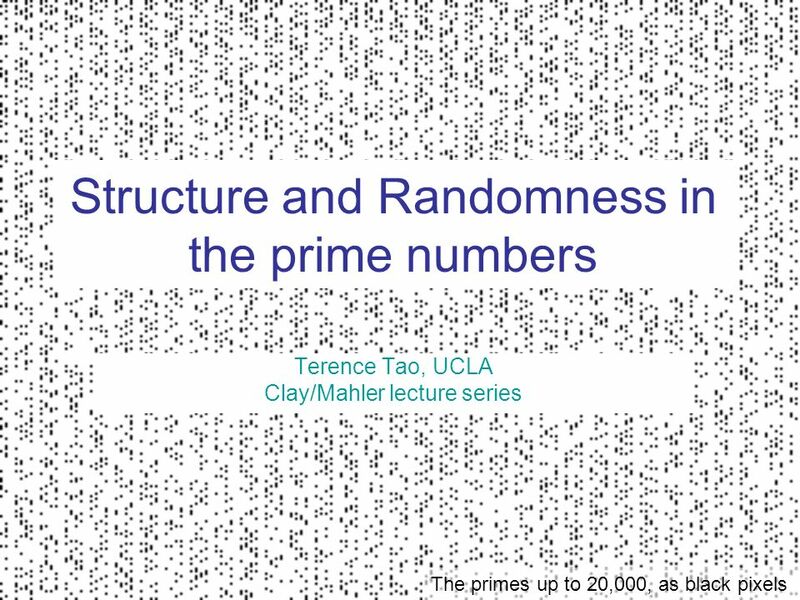 Structure and Randomness in the prime numbers Terence Tao, UCLA Deans Seminar, University of Sydney 8 Feburary 2008.